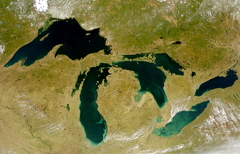 The Great Lakes Compact clears its final Legislative hurdle. After months of debate, the measure designed to prevent water diversions from the Great Lakes passed the Assembly late Wednesday afternoon. The vote came just hours after the Senate approved the bill. State Representative Jon Richards (D-Milwakee) says the compact will help protect a valuable resource from other states who would want to raid the fresh water. The measure passed 96-1. State Representative Sheryl Albers (R-Reedsburg) was the only "no" vote, citing concerns with how the bill could affect agricultural drainage districts. All eight states bordering the Great Lakes must sign the compact and it needs Congressional approval. Governor Doyle has said he will sign the measure, which will make Wisconsin the fifth state to ratify the agreement.